Cut zucchini any way you like, making thin slices, about 1/2". Pre-heat oven to 350 °F (175 °C). Grease an oven safe cooking sheet. Place zucchini slices in cooking sheet, sprinkle with chili pepper, garlic salt, and ginger as you wish. Keep zucchini in oven for 20 minutes, turn every 10 minutes on each side. After 20 minutes, take zucchini fires, out of the oven, and sprinkle with parmesan cheese. 436 members have added this recipe to their cookbook. These were good, but I didn't care for the skin. Next time I would take the skin off. They were definitely more like oven fries. Do you think that they would crisp up more if you fried them like fries? I have been missing fries so this might be a good option! very good and supper easy. Though I thought they would be crispy like regular french fries, but I cannot complain.And it was a hit with my 5 year old son. Yum! I've made these before and they make zucchini delicious. Do you think this recipe is good for MIT Carson Chow? A low carb zucchini recipe. Low carb Italian casserole with shirataki noodles. A gluten free main meal. 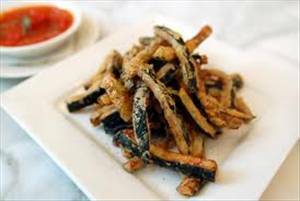 There are 172 calories in 1 serving of Zucchini Fries.